« Cambodia!!! With 20 fun-filled illustrations! 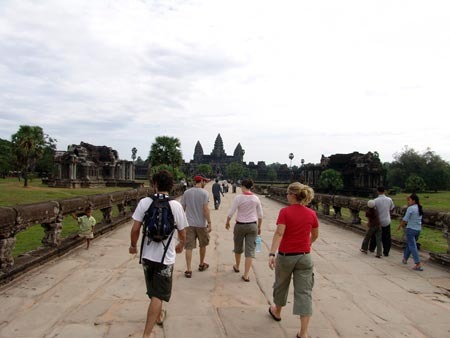 On the 13th, we visited Angkor Wat, a massive thousand year old temple complex outside Siem Reap, Cambodia. It’s one of the world’s top archaeological sites, and had been forgotten for a good while when it was rediscovered in the 1920s. It has since become one of the top tourist destinations in the world, and we obviously couldn’t skip it. 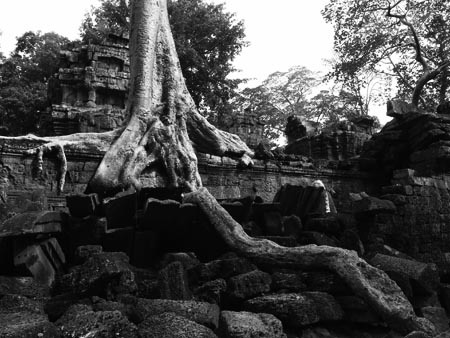 This is the main temple, called Angkor Wat (the other temples in the Angkor Wat complex have other names). It’s MASSIVE! 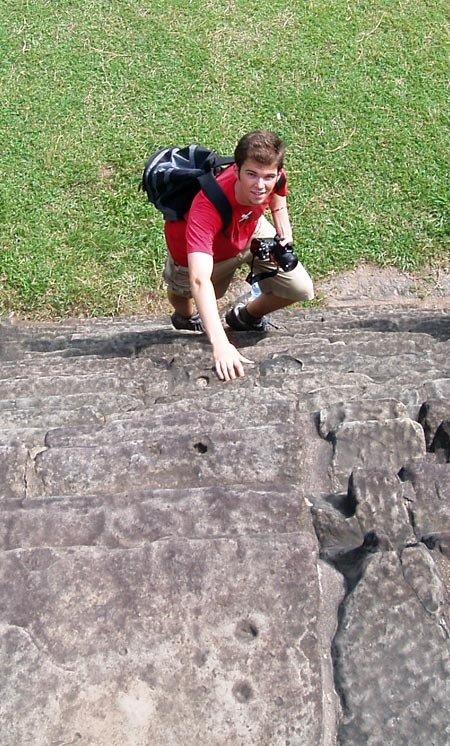 We had to climb some crrrrazy steep steps, and the railing going back down was VERY dodgy. 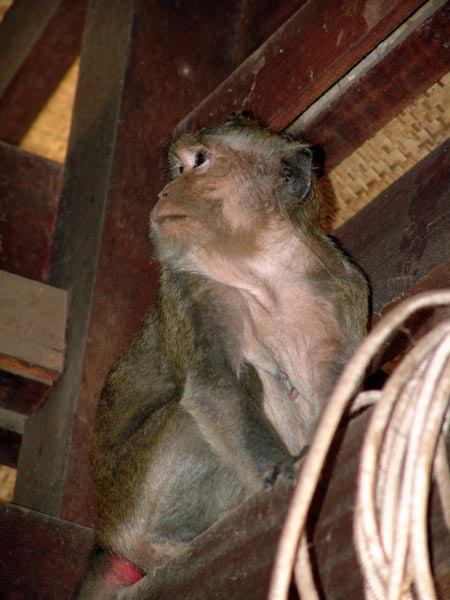 After going through the main temple, we sat down for a few minutes and heard some rustling in the thatch roof, and lo and behold a monkey popped out! Amazing eh? It was really nifty, these trees are all just growing right in and around the temple buildings, through windows and doors, up over rooftops and all around the courtyards. 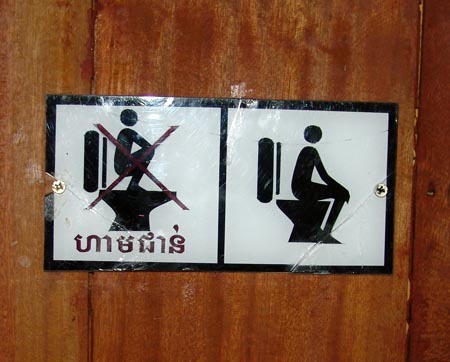 On our way to another temple we stopped to use the loo. I found this sign in the men’s stall, and couldn’t resist taking a pic. Am I the only person who found this funny? 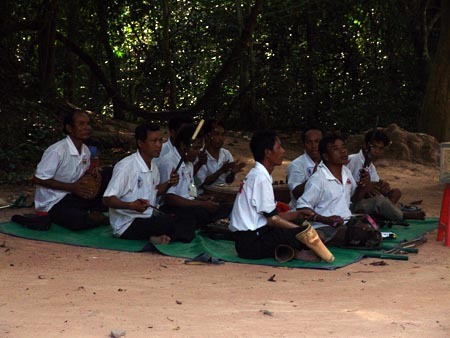 At the next temple there was a band of landmine victims, playing some cool Khmer style music, so we gave them some small donations and whatnot. Turns out they were on the street and this one landmine victim started up this group to get them off the street, working as musicians and selling souvenirs and stuff. A few little girls were following us around this particular temple, as small children often do in SE Asia, and particularly in Cambodia, trying to sell us postcards. 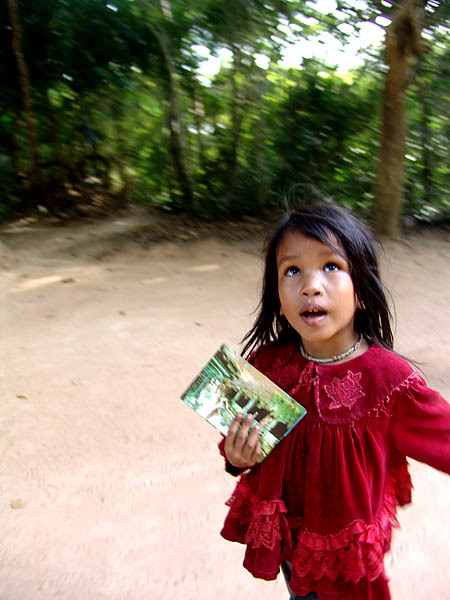 I didn’t want any postcards, but I paid this little girl about half a cent to take a photo of her. Later on, she came back to try selling postcards again and I just took this pic instead. She honestly looked about 4 years old. Finally we went to a temple on a 60m high “mountain” which must have been nearly impossible to build, to watch the sunset. Of course, it was packed with people because it’s such a touristy thing to do. 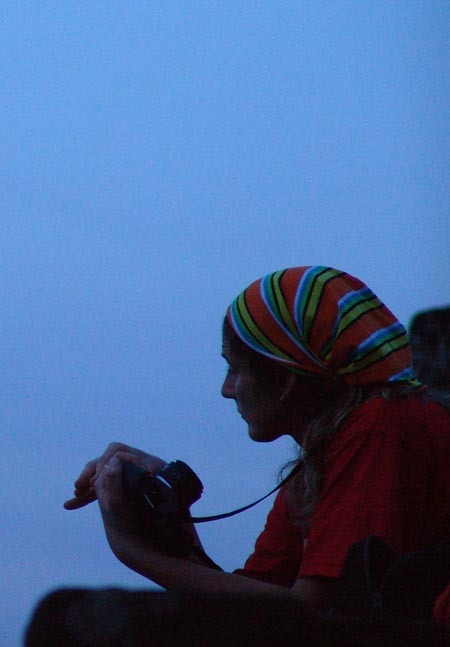 The sunset wasn’t all that great, so I took photos of people around me like this lady with her camera. After the sunset, we headed back down the steep track to the road and caught our tuk-tuks back to the guesthouse. 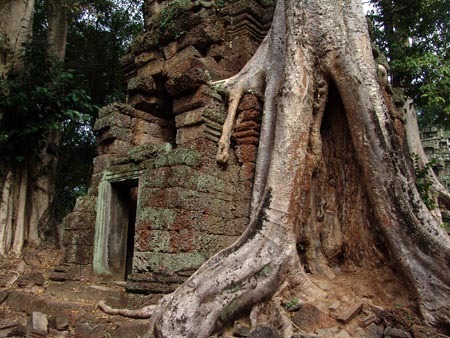 This entry was posted in Asia, Cambodia, Travel and tagged Angkor Wat. Wowz, all your pictures are fab, but that last one is wonderful! good use of colour.